Atlas Honda has introduced the all new 150cc motorcycle named CB 150F in Pakistan to cater to the higher end segment. The new Honda CB 150F is a sleek and stylish looking motorcycle with Turbo Engine Technology, ASV & ACV. Other features of Honda CB 150F motorcycle are high performance self start system with multiple roller bearings and spark-less brushes, 5-speed constant mesh, noncyclic Transmission for smooth gear shift and maintenance free powerful backup battery, die casted “Z Section Spokes” alloy rims. Thanks to its magnetic ignition protection the bike starts only with the original key. Front disc brake, car type speedometer visibility, strong tail protection and protective chain guide system make the rides extremely comfortable. 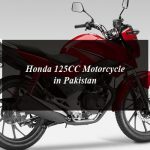 The Price of Honda CB 150F motorcycle in Pakistan is Rs159,000.